Purple is my favorite color. Squeegy is what I am. Purple Myrtle Squeegy Perzine was conceived as a way for me to write whatever makes sense to me and may not make sense to anybody else. Things I think about constantly. Fallopian Falafel is for women. PMS is for me. Though I greatly enjoy and do find comfort in writing Fallopian Falafel and reading people's submissions, I wanted to create something purely personal. Mine, mine, mine. Very selfishly mine. 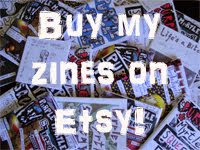 The PMS Perzine will be made by hand, and cause many paper cuts and sticky fingers. This blog will serve as a tracking of the zine and may contain some scans from the paper copy, but not full versions of it as does the FF blog. Feminist zinester. Punk metalhead. Riot Grrrl badass. From Jerusalem, Israel.